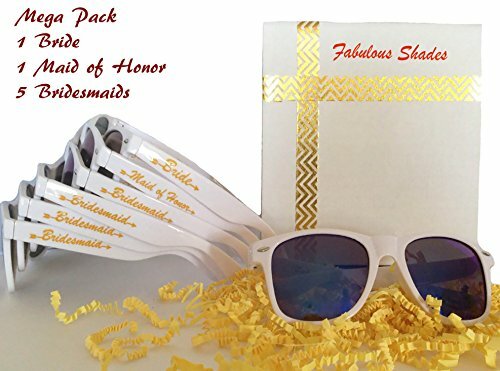 Bridal Bachelorette Party Favors- 7 pairs: 1 Bride, 1 Maid of Honor, 5 Bridesmaid Sunglasses by Fabulous Shades. 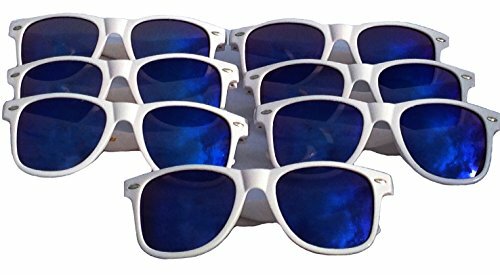 IMAGINE EVERYONE IN YOUR TEAM BRIDE WEARING THE SAME MATCHING WHITE FRAME BLUE LENS SUNGLASSES which are designed especially for the Brides and her Bridesmaids. 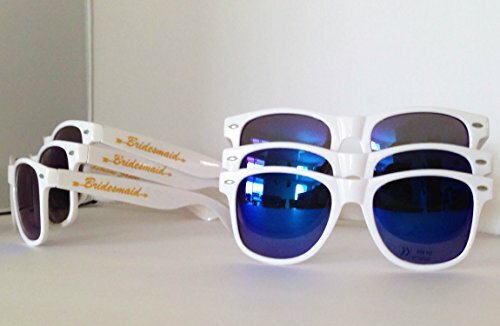 These sunglasses are perfect for bridal gifts, bachelorette parties, bridal parties, wedding photo on the Big Day or beach themed getaways. 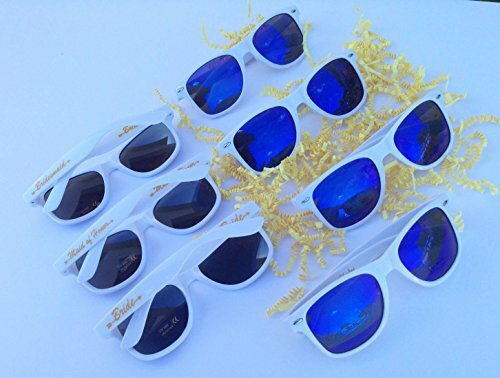 NO NEED TO APPLY SMALL STICKERS TO SUNGLASSES YOURSELF because our sunglasses are imprinted with cute designs and ready to wear. 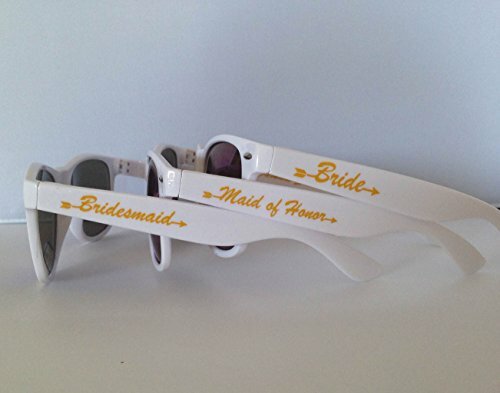 Set includes 1 "Bride" sunglasses for the Bride and 1 "Maid of Honor", 5 "Bridesmaid" sunglasses. 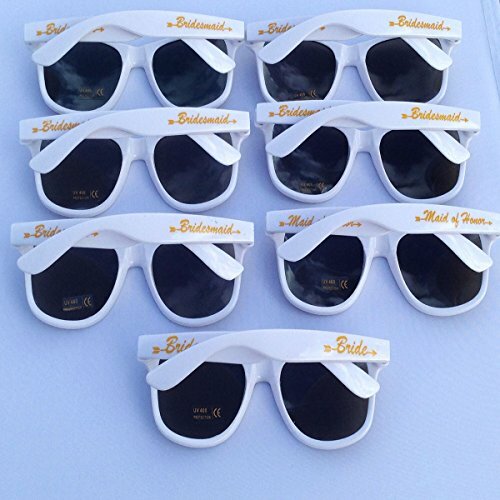 PROTECT YOUR EYES AGAINST HARMFUL UV RAYS with our UV 400 Protection Reflector Mirrored Lens. SATISFACTION GUARANTEE because your Big Day means a lot to us too. If you are not completely satisfied, contact us immediately! 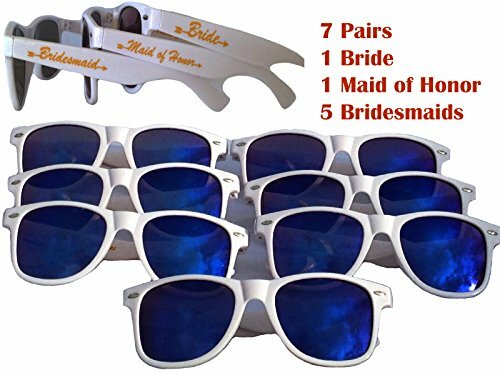 MEGA SET of 7 PACKS: 1 "Bride", 1"Maid of Honor", 5 "Bridesmaid" sunglasses.